Brand new in my Etsy shop now- my Nightlife necklace features black and white agate, black onyx, black fire crackle agate and lots of shining sterling silver. The perfect gift for the girl that likes to stand out from the crowd! Well hello there! I bet you thought I just fell off the face of the planet didn't you? I know it's been some time since I've posted on this blog, but believe me, I've been keeping busy with Etsy, making jewelry, and keeping my beloved furry, feathered and scaled friends happy and healthy. The really good news is that I have a brand new collection of jewelry to share with you today! Are you ready to see it? I decided my summer collection needed to be fun, colorful and bohemian inspired! I love the gypsy boho look and summer time is the best time to show it off. It's great for the beach, a summer concert, festivals or just anytime you want to look fresh and simply stunning! Here's a glimpse of my new designs- if you want to see more pictures and get all the details please just visit my little Etsy shop by clicking here: Grey Girl Designs on Etsy. My designs feature bright and beautiful natural stones like turquoise, red coral and amber. In some of them I have incorporated colorful Indonesian glass beads- I think they are really fun! All of the metal components are sterling silver. I hope to have many more pieces to add to this collection before the summer is over. I really hope you like these vibrant additions to my Etsy shop! Thanks for taking a look! Hi! Now that fall is in full swing and Thanksgiving is right around the corner I figured I'd better share my fall 2012 jewelry collection. I know I am usually running a month or so behind everyone else but I really do try my best to keep up with the crowd! So while the rest of the world is already busy working on their goodies for Christmas, I'm finally ready to share my autumn inspired work with you! My Wild Berry necklace is a perfect combination of shades of green African jade chips, green glass beads and kambaba jasper mixed with deep red garnet and sterling silver. It is an adaptable necklace and can be worn as a one strand or two strand necklace. Wear it the way you like! My Wild Berry earrings were made to compliment the necklace, but of course they'd be perfect by themselves as well. These earrings are fun and dangly post style earrings that hang 2.25" and feature sterling silver, green glass beads and garnet. Another adaptable design, my Pumpkin Spice necklace can be worn as a two strand statement necklace, or a one strand necklace with a matching bracelet. It's a delicious blend of tiger jasper, red aventurine, crazy horse stone and sterling silver. The focal point is a Hill Tribes antiqued fine silver pendant (24x12mm) created by hand in the remote mountain areas of Thailand. It is stamped with a design of leaves and flowers. These delicate sterling silver fish hook style earrings hang approx 2.25". They feature sterling silver components, tiger jasper stone and red aventurine. I thought this unusual color combination would really stand out for fall! 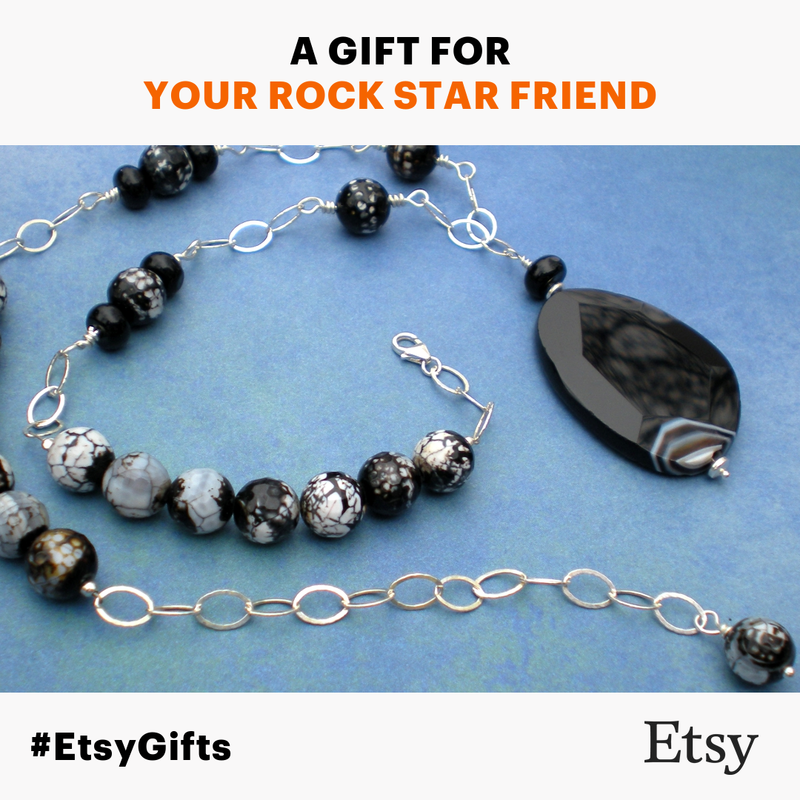 This one of a kind necklace features fire crackle agate rounds perfectly faceted to sparkle, complimented by faceted smoky quartz and lots of brilliant sterling silver. It is finished with a sterling silver lobster claw clasp and a delicate sterling silver feather charm that hangs sexily down the back of your neck for an extra special touch. This one is perfect for a night out on the town. ﻿These unique earrings are one of a kind and designed to complement my Smoke and Ashes necklace. The sterling silver fishhook style earrings hang approximately 1.75". They are sure to add a touch of glamour and excitement to any outfit! It finishes with a sterling silver lobster claw clasp and a delicate sterling silver leaf. I have selected this necklace as a Madcap Charity item. I want to help those affected by the recent Hurricane Sandy. So many people have suffered from this disaster! With the sale of this necklace I will donate a portion to the American Red Cross to help support the victims of Hurricane Sandy in the northeastern United States. The Wild Berry earrings are also a Madcap Charity item with a portion of the sales pledged to help this cause. November Blaze celebrates the fiery colors of fall. It was inspired by a walk through the trees in early November, the oranges and greens of foliage were so brilliant and eye catching that I wanted to convey that beauty in a piece of jewelry so it could be worn all year long. It features a large red agate oval (40x28mm) surrounded by more red agate, delicate leaf shaped sterling silver beads, sterling silver chain and fancy jasper. I think it's a great statement necklace to add a pop of fall color to your life. Thanks so much for taking a look at my fall 2012 collection! I put a lot of time and careful thought into each piece I design. If you would like more info about any of these pieces please visit my Etsy shop for more detail. There are several more pictures of each as well as measurements. You can also send me a message on Etsy if you have any questions at all. I would love it if you'd leave a comment here and let me know what you think! Hello! If you are a regular reader of my blog, I've shared with you all before that I love going to our local Kansas City Renaissance Festival. It is one of the highlights of the year for me! Yes, I'm still a kid at heart and all the people in costumes, performances, artwork and well, just the pagentry of it all leaves me thrilled and feeling inspired. OK, so the men in tights are a plus too! I sometimes get into the spirit of the faire so much that I go in costume. This year I went as a raven! I found the absolute coolest raven mask on Etsy. It got so many compliments at the faire too. I was impressed that the mask was very lightweight and very comfortable- sometimes I even forgot I was wearing it. To add to the look, I braided some black feathers into my hair. I wore a very exciting dress that I also got from Etsy. It has a hood, so I was able to wear the hood up for a mysterious look or down when it got warmer outside. It was a beautiful day and we had a lot of fun! Who knows what look I'll come up with for next season! Annie Libertini does wondrous things with leather! Zhenn is a fabulous seller and has such cool creations in her Etsy shop. If you are ever in the Kansas City area in the fall (Sept 1-Oct 14) you should check out the Kansas City Renaissance Festival. Here's the link if you need more info: http://www.kcrenfest.com/ It's a great time for adults and children with plenty for all to do. Hello! 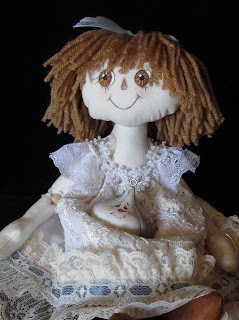 When you were a child did you have a favorite doll or furry friend that shared adventures with you? My favorite was a stuffed yellow monkey dressed in a blue dress named Maria. I just loved my dolls and stuffed animals, they were a big part of my childhood and I really can't imagine growing up without them. Did you ever think about the person that created them though? To continue my series of posts of interviews with artists, today I'd like to share with you an interview I did with Carolyn Robbins of Warm Heart Bears and Rose Cottage Dolls. Please enjoy! Hi Carolyn! Thanks so much for taking time out of your busy schedule to do this interview with me! Please tell my readers a bit about you and your life. 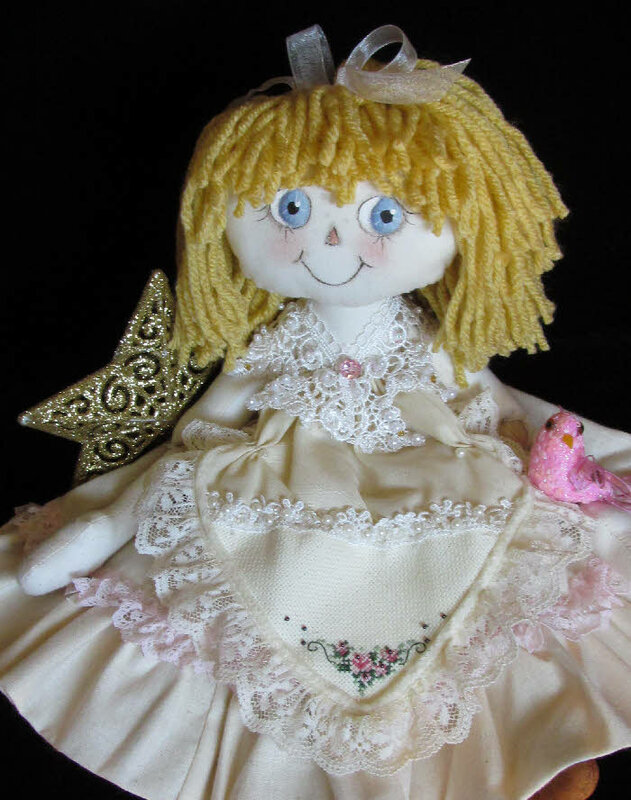 Coming from a very artistically talented family, I have been involved in handwork from an early age, and have designed and created hundreds of bears, dolls and home décor items. 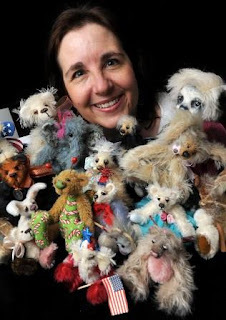 I began creating miniature mohair teddy bears in 1995 when The Patchwork Ark was established. 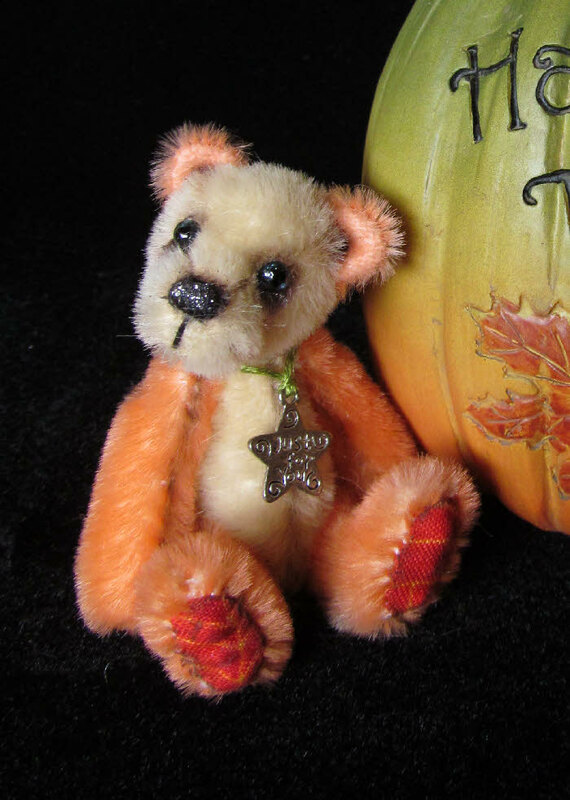 The original designs included miniature bears and home décor items. 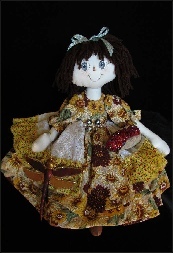 It was not long before I added art dolls to my product line. How did you first become interested in creating stuffed creatures and dolls? Dolls and Bears remind me a lot of childhood and I think I began making them because I wanted to bring the same feelings to others. It is sometimes easier to get through tough times when we remember happier times of our childhood. I am a self-taught artist. Most everything I do was learned through trial and error and a good bit of God given talent! What inspires you when you aren't feeling creative? Looking at nature and home décor styles always inspires me to create! It would be hard to choose a favorite creation! 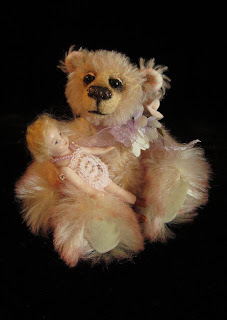 Bears or Dolls… Here is an example of both. I do enjoy creating bears more than the dolls, but each one is so unique. Because of their individuality, it is hard for me to choose one over the other, kind of like children! As I think about it, the new designs I am now making …I do like them better than my first bears. I think it is this way with all artists. What is the most difficult part of the creation process for you? The most difficult part of the creation process is creating exactly what I see in my minds’ eye. As I imagine what I want the bear or doll to look like, sometimes it is the actual creating that gets in the way of the process. I think we always strive to make a better product. How did you learn about Etsy and decide to open an Etsy shop? I learned about Etsy from a fellow artisan who creates jewelry. We both did the same show together for years and I thought it was time to give it a try. I know you belong to the Artisan Group and get to participate in gift bags for various events...tell us a bit about this group and how it works if you could...how does it feel knowing your creations end up in the hands of celebrities? The Artisan Group is a wonderful supportive group that allows its members to be a part of gift giving at several awards shows and special events. We must sign up to take part in these events on a first come first serve basis. There are various levels of participation to choose from. Knowing that my little bears are going to people I do not know is exciting! I hope they bring a little joy into the lives of those who receive them. 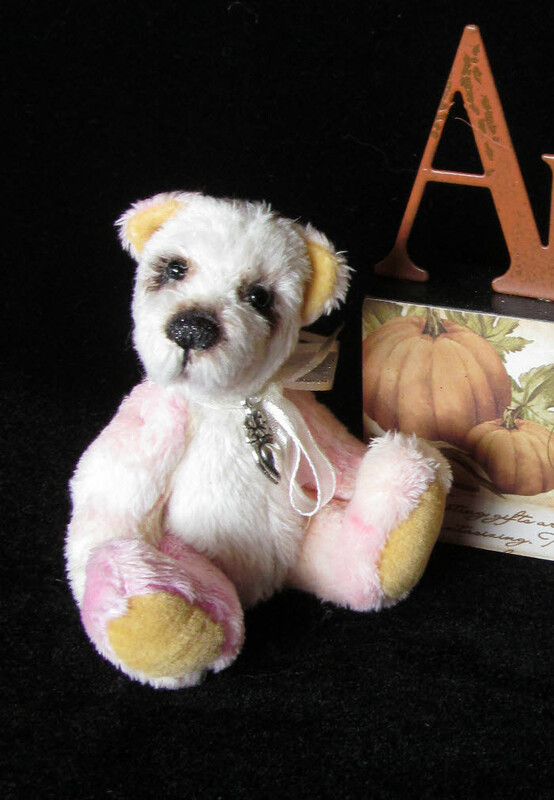 Is creating for Rose Cottage Dolls and Warm Heart Bears your day job? Yes creating for Rose Cottage Dolls and Warm Heart Bears is my day, and night job for most of the week. I do work part time outside of the house at a local gift shop but the bears and dolls are my full time “job”. I think my idea of the perfect day would be enjoying the day with my husband and daughter, including our three cats!! Fall and winter are my favorite time of the year, so I am enjoying these fall days! Thanks again for taking a moment to share your wonderful bears and dolls with us! I think they are all so unique and beautifully made! I hope you enjoyed my interview with Carolyn. 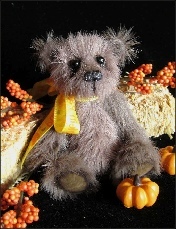 If you are looking for a handmade art doll or artisan bear to add to your collection I hope you'll check out Carolyn's creations! Hello! In past posts here on my blog I've shared with you different ways I go about designing and creating a piece of jewelry. Today I'd like to tell you about my newest creation, Royal Beauty. The Royal Beauty set was designed based on the concept of adaptability. I wanted to create pieces that work equally well on their own or together. In this particular set, one of the pieces can also be worn as different kinds of jewelry- a choker necklace or a bracelet. It's the ultimate in adaptability and I hope whoever ends up with this set has fun wearing it in all the different ways possible. As I started off thinking of how to make it adaptable, I had to decide what color scheme to go with and how to mix the colors of the two different pieces to make them interchangeable. I decided to go with shades of purple for this one- I had a really pretty piece of purple agate just begging me to create with it. This particular piece of agate combines shades of purple with brown. I could have added some brown into the main design of either piece but it just didn't feel right to me- I wanted to concentrate on the purple and silver and let the agate really stand out. Royal Beauty in the planning stage! The picture above shows the two necklaces in the planning stage- it takes me a lot of playing around with my beads to get them the way I like! Originally I was going to have the shorter piece as only a bracelet or an add on to the main necklace- but the more I arranged and rearranged it became longer and longer until it could be either a choker or a bracelet wrapped twice. For me, the best part of making jewelry is in the design process so I really take my time with each piece and make it best reflect the beauty of the stones and materials I use. If while I'm designing the idea changes, then so be it! So that's the story of the latest addition to my Etsy store! I would love it if you'd take a look at my jewelry selection and let me know what you think. My jewelry is unique- when you purchase a piece of jewelry from me you aren't getting a piece of mass produced jewelry that someone else out there will be wearing. My designs are one of a kind. I believe a piece of jewelry should be as unique and individual as the person that wears it. I hope you can see that I try to let the beauty of nature shine through in my work and let it compliment the wearer. I have fun creating my jewelry designs and I hope you will have fun wearing it! My Run with me necklace was included in this beautiful collage on Polyvore by Amy from It's a Madcap Life Etsy team. I love all the cool horse finds from Team Madcap and am honored to be included! Thank you Amy! I am an animal lover, jewelry designer, peace loving hippie kind of girl.